A traffic jam on the second ring road in Beijing. Commuters in Africa, Europe and the US all follow the same fundamental pattern of travel between work and home, confirming a theory first suggested 20 years ago. Back in 1994, the Italian physicist Cesare Marchetti hypothesised that throughout history, the average amount of time that people spend travelling each day is about 1 hour. This number—1 hour—is now known as Marchetti’s constant. So Neolithic humans would have spent the same time travelling each day as 21st-century humans spend commuting. And commuters in sub-Saharan Africa spend the same time travelling as workers in North American megacities. At least, that's the theory and one that makes sense given that humans have to balance the time they spend travelling against the time they spend producing the food or money necessary to survive. But is Marchetti’s hypothesis actually true? Various researchers have studied this question and come up with evidence both to back Marchetti’s ideas and refute them. But at the heart of all these studies is a problem: they all rely on different data sets that are not easy to compare. These datasets include different types of surveys asking different questions and including different types of trips and so on. It’s eminently possible that researchers’ opposing conclusions are simply the result of the way they collect their data rather than representative of the underlying patterns they want to study. What’s needed, of course, is a way of comparing commuting patterns that is exactly the same in different parts of the world. And today we get the results of one such study thanks to the work of Kevin Kung and pals at the Massachusetts Institute of Technology in Cambridge. These guys say Marchetti was right—that the time humans spend commuting is about 1 hour and largely independent of the distance, the country or even the continent in which they live. The key to this work is the widespread availability of mobile phone data in different parts of the world. In this work, Kung and co compare the same type of data from people in Portugal, Ivory Coast in sub Saharan Africa and in Boston. Their first task was to work out the home location of each cellphone user. They did this by assuming that people are at home at night and at work during week days. By determing the base station at these times, they could also calculate the distance that people travelled to and from work. To work out the commuting times, they used the time of the last phone call from the home location as the start time for the journey and the time of the first phone call from the work location is the end of the journey (and similarly for the evening commute). This gave them an upper estimate for commuting times. 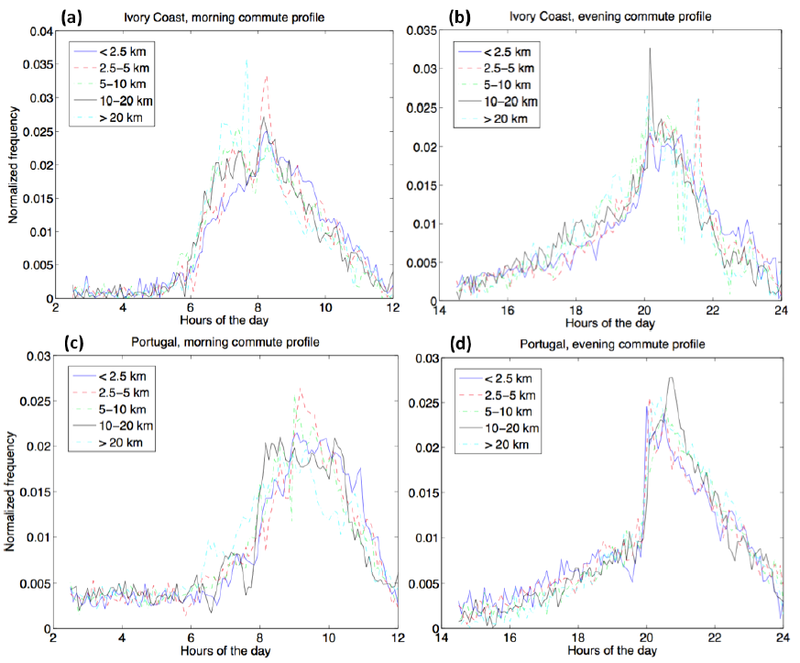 The results show that commuting patterns in Ivory Coast, Portugal and Boston are remarkably similar. Most people commute between the hours of 8 and 10 in the morning and are home by about 8.30pm. And the further they travel, the earlier they leave. There is a little more variation in the evening commute in Portugal than Ivory Coast, with people taking longer to get home. That's probably because people linger in the evening for drinks or dinner in Portugese cities. By contrast, hazardous night-time driving and unreliable public transport in Ivory Coast mean that commuters have a greater incentive to be home early, say Kung and co.
More surprising is that the commuting time does not depend on the distance of the commute. So regardless of whether commuters walk, catch public transport or drive, they all spend about an hour on the road. And that’s true in the US, Europe and Africa. That’s more or less exactly as Marchetti hypothesised 20 years ago. Of course, it’s not possible to say with certainty whether Neolithic humans followed the same pattern. But it’s not beyond the realms of possibility given that this fundamental law of commuting seems to apply today in wildly different parts of the world.